Honda will debut a Civic-based concept car aimed specifically at cyclists called the Active Life Concept at the Frankfurt Motor Show. Designed to show how massive the Civic Tourer actually is, the Active Life Concept includes an integrated bike rack that extends out from the boot so that owners can maintain their bicycles. A retractable bench gives owners somewhere to sit outside, and there’s even a water tank and tool box built into the boot lining. On top of the roof is one of the more aerodynamic storage boxes you’ll see. To distinguish this as a special sort of Civic Tourer, its blue-to-gunmetal paint job is a custom one, and inside the stitching is contrasting blue. The suede and leather seats are finished with blue detailing too. 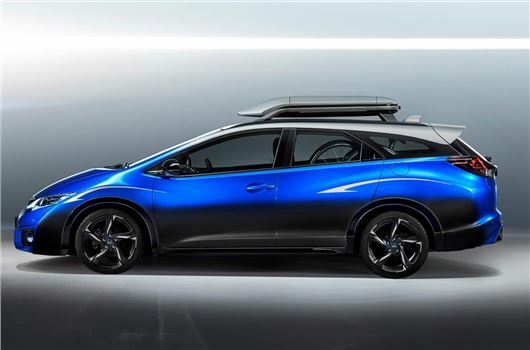 All this is designed to highlight the Civic Tourer’s 1668-litre total cargo space, although the car not just a cavern on wheels – a 1.6-litre diesel Civic Tourer recently set a Guinness World Record for fuel efficiency. Over 25 days it averaged more than 100mpg while travelling through 24 countries, covering a distance of almost 8400 miles.